This story has been updated with comment from PepsiCo. Workers at several Indonesian palm oil plantations that supply Pepsi and Nestle suffer from a variety of labor abuses, including lower-than-minimum wages, child labor, exposure to pesticides, and union busting, according to a new report from the Rainforest Action Network (RAN). The report covers three palm oil plantations operated by Indofood, the biggest food company in Indonesia and the country’s only producer of PepsiCo-branded snacks, and follows up on previous reports from the same groups of plantation workers. Indofood remains certified as “sustainable” by the Roundtable on Sustainable Palm Oil (RSPO) despite ongoing labor abuses, which activists say raises the question of what possible incentives there are for a mega-corporation to reform its labor practices. Indofood, and RSPO could not be reached for comment. "PepsiCo takes the issues associated with palm oil and any reports of non-compliance with our human rights and environmental policies extremely seriously. Despite having no contractual relationship with IndoAgri, we have made significant efforts to resolve the claims associated with the company. We have shared these efforts with RAN, which makes their allegations especially surprising. While RAN is willing to make false claims about PepsiCo’s efforts with IndoAgri, they are burying the fact that they have refused to participate in an open discussion with RSPO and IndoAgri to address these allegations. In April 2016, PepsiCo was informed of labor rights allegations made against IndoAgri, which is a completely separate subsidiary of Indofood, with whom we are a joint venture partner in Indonesia. As we have made clear on multiple occasions, PepsiCo has no contractual relationship with IndoAgri. Nevertheless, we reached out to IndoAgri in the hope that we might help bring about an appropriate resolution. For example, a letter was sent from PepsiCo’s Chairman and CEO conveying our concerns, and we have had meetings and calls with the company to discuss the allegations and their actions to address them. We also wrote to the RSPO, with whom RAN formally filed a complaint, supporting a meeting between IndoAgri and RAN. Though the RSPO has offered to facilitate meetings, RAN has not agreed to a meeting. Addressing justified concerns about standards within parts of the palm oil sector requires cross-sector collaboration and we welcome genuine efforts to share information and expertise. There is a limit to how much PepsiCo can affect change if RAN continues to refuse to meet with the key stakeholders." Workers at palm oil plantations on the islands of Kalimantan and Sumatra reported the same catalog of abuses that they suffered 17 months ago, such as exposure to dangerous pesticides with inadequate protective equipment. They also complain of withheld wages and unpaid overtime, as well as frequent use of daily contract workers and unpaid laborers (like workers’ wives), which the study authors say are all also risk factors for child labor. “We’re asking that Indofood reform labor practices on its plantations immediately,” said Lierley. “PepsiCo has a significant amount of leverage.” “Indofood could certainly move the needle” as well, she said. 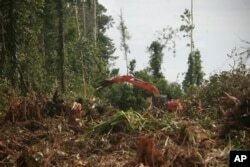 But the RSPO has no clear path forward, admitted Robin Averbeck, a RAN campaigner. RSPO has never revoked a company’s sustainability certification for labor violations. “After nearly a year and a half of an official RSPO complaint containing indisputable evidence documenting widespread labor violations on multiple Indofood plantations, the RSPO has failed to sanction or suspend Indofood,” said Averbeck, who said the inaction was a “fundamental failure” and suggested that the RSPO suspend Indofood immediately. Labor abuse in Indonesia is not unique to the palm oil industry — it has been documented widely across the garment, domestic work, and mining sectors, among others — but in recent years, palm oil has become particularly ripe for exploiting workers. Palm oil is found in countless household products and foods, from lipstick to potato chips, and it grows very well in the tropical rainforest of Southeast Asia. It is cheap and easy to plant at great scale and swathes of the Borneo rainforest in both Indonesia and Malaysia, have been transformed in recent years into the trademark bright green grids of a palm oil plantation. But the crop has displaced dozens of indigenous communities and employed thousands of child laborers and unpaid, underpaid, and abused workers. Global demand for palm oil shows no sign of slowing down — the industry is estimated to be worth $93 billion by 2021. The best mechanism for workers’ rights remains trade unions, but there are a number of obstacles to effective organizing among palm oil workers, according to Andriko Otang of Indonesia’s Trade Union Rights Commission. “For one thing, there is the sheer difficulty of organizing,” said Otang. “A worker has to spend 400,000 rupiah (about $28) for a one-way ticket to the regional capital.” A roundtrip could turn out to be half their monthly salary, he said. Another factor is the logistical barriers to organizing in places like rural Kalimantan, where there is weak cell signal and low access to information. “If you want to organize even a single strike, it’s so difficult,” said Otang. Beyond discriminating against actual and potential union members, according to the RAN report, Indofood employs a large impermanent workforce, who cannot unionize. According to its 2016 Sustainability Report, Indofood’s plantation arm, IndoAgri, reported 38,104 permanent workers and 34,782 casual workers. Despite the formidable odds, said Otang, there have been success stories for palm oil workers: in South Kalimantan and Palembang, workers have organized multi-company collective bargaining agreements and abolished the practice of casual work. “As long as you have a strong independent union and solidarity between officials and members, labor reform is possible,” he said.